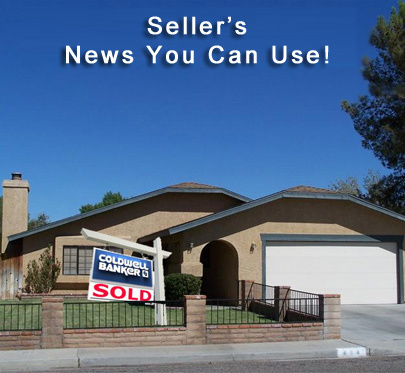 Below is a list of common Frequently Asked Questions by sellers in the Ridgecrest, CA area. If you have a question that's not answered here, or if you'd like to speak with one of our agents, please call us at (661) 822-5553 or drop us an e-mail! Q - How much is my house worth? A - There are a number of factors that determine your houses value - and several items you can do that will increase the value of your home. Ultimately, the market will determine your property's value. A close estimate of value can be determined by examining competing listings, listings that were over priced and did not sell, and listings similar to yours that have recently sold. We highly recommend that you get a CMA (Comparative Market Analysis) from one of our professional agents and a FREE Property valuation. In addition to the property valuation, we can provide you with several market statistical reports, and give you some important tips and information on how to get the most on the sale of your property in the shortest time possible. Q - How much would you charge to sell my home? A - First, it's important to know that you don't pay us a dime until your property sells. We are paid by commission when the sell finalizes. A tipical real estate commission on the sale of residential homes in our area is between 5-7%. Most of our sellers have found that they make at least that much more by listing their home on the MLS and selling it through a real estate company than they could have by selling it by themselves. Never under-estimate the value of working with a real estate professional. Because most out of town buyers work with a Realtor, you will expose your home to more buyers by listing with our office - which in turn means a quicker sell, and a higher price. For more info. on what services we provide and how it will help you end up with more money at closing, give us a call or drop us an e-mail. Q - Will my home be placed on the MLS? A - Yes - unless you specifically ask us not to put it on the MLS. MLS stands for Multiple Listing Service. It is the central database of listings used by the majority of the real estate agents in our area. By placing your home on the MLS, you will have exposure to the maximum number of buyers from many sources including the clients of all MLS participants, numerous websites such as: Realtor.com, Trulia, Zillow, and many other sites of local real estate agents. Q - How long will it take to sell my home? A - While there is no guarantee - and several factors that influence the time it takes to sale a home, we are currently seeing homes sell between 1-6 months. How your home shows and where it is priced are two major factors that will determine the time it takes to sell. For a FREE statistical report showing average days on market and/or a Free consultation about the current market conditions and your real estate needs, please call us today at (661) 822-5553. Q - What should I look for in a listing agent? A - When looking for an agent, you want someone who has experience, knowledge of the market, and someone you trust and feel comfortable with. We recommend interviewing with at least 2 agents before making a decision about which one you want to work with. Here are a few tips to help you select the best agent for you. Click the Meet Our Agents section to start your selection process. Be willing to call or email a few agents and interview them. Ask why you should work with them and what services they will provide. Once you select an agent, always let other agents know that you are working with an agent and who that agent is. Q - How much money will I end up with after my home closes? A - There are many costs and expenses associated with selling your home, and nothing is worse than unpleasant surprises at closing. Contact one of our agents today to review those costs. We will prepare a FREE Seller's Net Sheet report for you that shows all of the closing costs, and the estimate of your net proceeds with a low and high selling price range. Q -Do I need to be out of my house during showings? A - Usually we recommend that you leave the home while showing. This takes the focus off of you, and allows the buyers to think about the house and visualize themselves living in it. There are a number of factors to consider including security and the protection of valuables in your home, so we suggest discussing this issue further with one of our real estate associates. Q - Why should I list my home with a Realtor instead of selling it By owner? You can only get your home on the MLS by listing it with an MLS member. The exposure to potential buyers is much higher - resulting in more interest and competing buyers for your property. There are many Internet websites that only take listings from an MLS or a national real estate company like Coldwell Banker Best Realty. We'll help you avoid costly mistakes, negotiate the best price and terms, and reduce the hassels and stresses of buying or selling real estate.